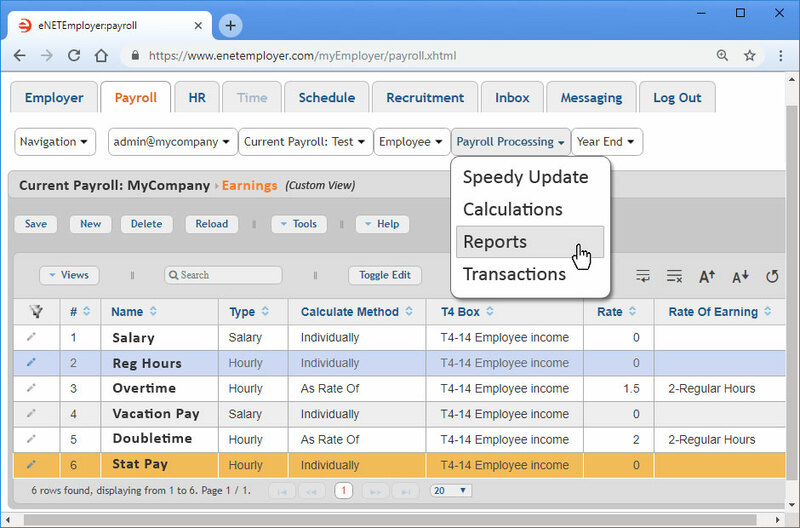 eNETEmployer allows you to easily manage your employee payroll processing and records including salaries, wages, bonuses, and deductions. Whether your company payrolls are simple or complex, eNETEmployer will make the employee payment process faster and more effective. 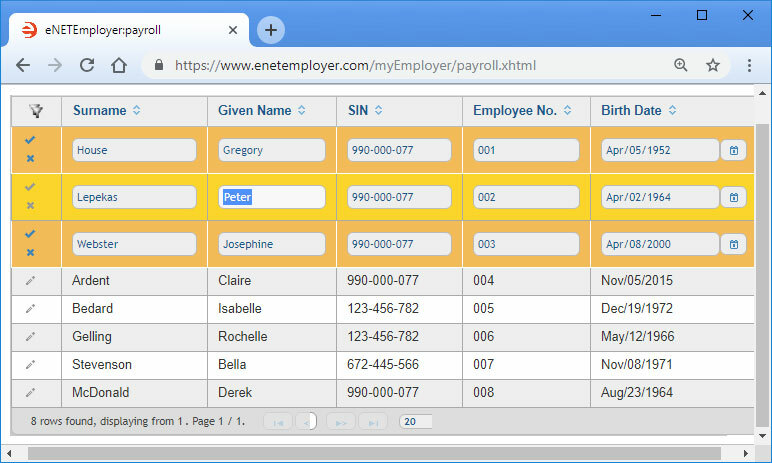 eNETEmployer includes all of the features you need to easlly create employee Records of Employment (ROE). Year-end functions are also provided to produce employee T4 and T4A's. The Electronic Funds Transfer (EFT) feature (also referred to as Direct Deposit) allows you pay your employee's electronically by transferring funds directly to their bank accounts. eNETEmployer uses a familiar spreadsheet layout that allows you edit data in place, re-order columns, expand and collapse rows, and sort / filter data. Flexible formatting options add further capabilities that not only improve readability, but also make it possible to use the data in external reports and presentations. Use the program's unique Customize Views feature to tailor the data display in any order and from any aspect. Show additional columns to drill down for detailed data analysis or hide entire columns to facilitate quicker data entry. 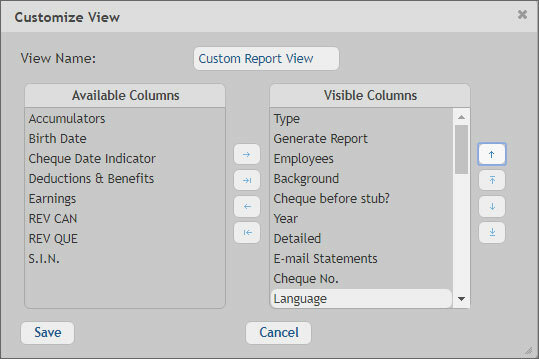 Custom views can be used to produce detailed reports that can be viewed onscreen or exported for external editing. eNETEmployer's basic pricing includes all of the features you need to pay your employees, including EFT. Everything from unlimited employees, interim payroll processing, extra or additional payroll runs, printed cheque or e-mail pay statements, employee self-service, customized reporting are included. Government and third-party remittances, ROE's and T4's are also available as add-ons* so that you pay only for the level of service you require*. Read below to learn about the list of services included FREE with your service fee. Personal pay stubs provide employees with detailed pay information including regular and vacation pay, bonuses, reimbursements and more. Employees can access their personal accounts to review pay stubs, pay history, edit personal address information and more - from any web-enabled device. The program supports both English and French languages for full employee support. Calculate an unlimited number of earnings such as Salary, Regular Hours, Overtime and unlimited deduction/benefits such as Group Insurance, Pension, etc.. Round out the payroll process to include accumulators for Vacation, Holiday, Sick Days, Banked Time and more. eNETEmployer gives you complete control over how often you wish to pay your valued employees - choose from weekly, bi-weekly, semi-month, monthly and more. Create custom formulas to specify the calculation methods deductions, benefits, accumulators, etc. Easily define WCB settings based on the requirements for your province or territory. If you know how to use a spreadsheet program, then you are ready to begin using eNETEmployer. You can enter data in column form, perform in-place editing in any cell, and even rearrange and sort column sequences. Deposits funds directly in up to three separate employee bank accounts (e.g. bank, credit union, or other financial institution) using our EFT feature. Export and Import data seamlessly between your existing accounting, time-tracking, or human resources software. Provincial and federal payroll taxes are calculated automatically, simplifying the government remittance process. eNETEmployer stores the data for all payroll calculations (including company and transaction data) so that you can easily produce the forms that will be required to perform your company's year-end process. Easily generate the Provincial and Federal payroll tax documents that are required each year for company tax filing. All forms can be accessed online at any time. Edit year-end forms to include last-minute adjustments and data corrections as needed. eNETEmployer's innovative spreadsheet view means that if you can see it on the screen, you can print it. Any screen or page view becomes a powerful report in your hands. 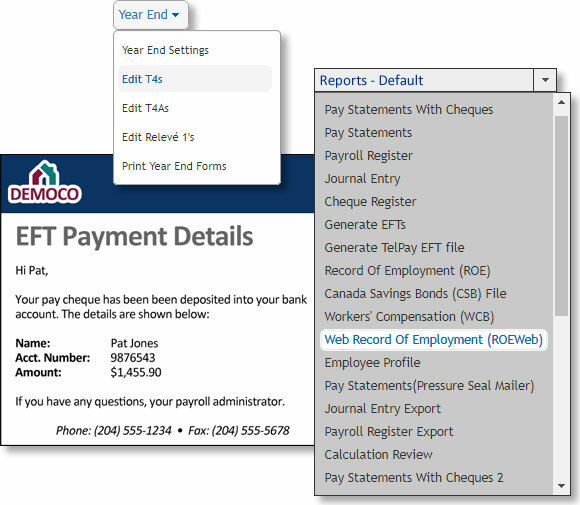 Produce pay statements, cheques, pay registers, journal entries and more. All reports are fully customizeable right on the screen. Use our detailed journals and reports to achieve a better understanding of your payroll. Review bank transaction statements to see your company's full financial picture. Define the users of the payroll system and assign the functions they can perform. We use 256-bit TLS encryption and employ Code Signing Digital IDs that enable our development team to create digitally signed software and macros for secure delivery over the Internet. eNETEmployer provides a secure authentication process - this provides both users and companies with piece of mind that all program sessions are private and protected. Add new employees quickly using a number of pre-defined employee templates - or create your own custom template. Calculate payrolls as many times as you need at no extra cost, including bonus, reimbursement or any other type. View employees by type or division for improved data analysis. eNETEmployer allows you to setup multiple payrolls to support different locations, regions and remote branches of your organization. Choose the Get Started button or call 1-800-665-5129 to begin! Would You Like Us To Perform the Payroll Process For You? We can process your payroll from start to finish. Just email us each employee's work hours and we do the rest! This includes entering your employee work hours, processing the payroll, paying your employees via EFT/direct deposit, and then making the necessary government and third-party remittances. Use the table below to view our fee-based services. And as always, if you need something else - ask us! Ask us about your custom payroll needs!